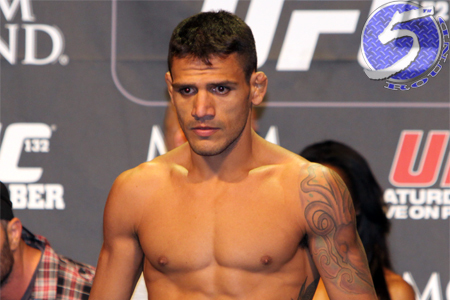 On Wednesday, a thrilling lightweight shootout between Rafael dos Anjos (pictured) and Jason High was added to the UFC Fight Night 42 roster. Dos Anjos is looking to bounce back from this month’s unanimous decision defeat to unbeaten Khabib Nurmagomedov. The Brazilian had rattled off five straight wins prior to his setback to Nurmagomedov. High drops from the welterweight class to collide with Dos Anjos. “The Kansas City Bandit” is victorious in nine of his past 10 outings.